Desarrollo de un nuevo carro medio basado en el Type 59 que comenzó en 1962. Se esperaba que el nuevo carro presentara mejoras en la potencia de fuego y protección blindada. Sin embargo, se canceló el proyecto poco después. Algunas innovaciones técnicas se aplicaron más tarde en el desarrollo del Type 69. Todos los prototipos del 121 fueron destruidos durante las pruebas de armas nucleares chinas. 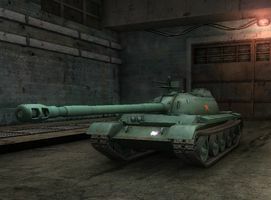 The 121 continues the Chinese tradition of installing the largest gun possible on a medium tank. The 121 is an all round improvement over the WZ-120 with improved armour and armament while still retaining the frustrating problems of sluggishness and lack of gun depression. With its 122mm gun, the 121 can remove huge chunks of hit points from enemy tanks, out trade similar tier medium and heavy tanks and suffer minimal damage due to the good armour values of the hull and turret. 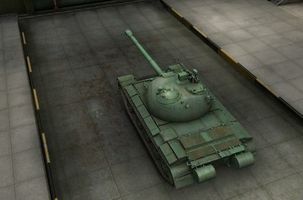 The 121 is a menacing opponent for any tank in a straight close-range brawl and is capable of carry games with its raw damage output but can be reduce to almost worthless if its weaknesses are not addressed appropriately. Worst shell velocity of all tier 10 medium tanks. 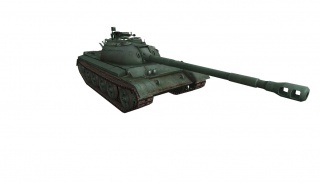 The 121 is superficially similar to the T-62A, being one of the many tanks descended from the T-54. It has near identical camo values, which are excellent, similar hull geometry, and similar hard stats (engine power, front turret armor). However, the lower gun depression and high alpha/low penetration gun make it a completely different vehicle. 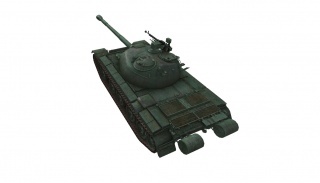 It's ideal for those who wished they had a T-62A configured for brawling. Close to mid-range is where the 121 outperforms the T-62A. In comparison, the T-62A's shell velocity is much higher (due to lower caliber and standard APCR ammo) and the tank is more agile. The 121's slower-moving shells, longer aim time, and non-existent gun depression make it sub-par at long-distance sniping. However, the 121's accuracy is still quite decent for a chinese tank, especially in comparison to its predecessors. Boasting the highest alpha damage and second highest DPM among the tier X mediums, the 121 is well-stocked in raw firepower. 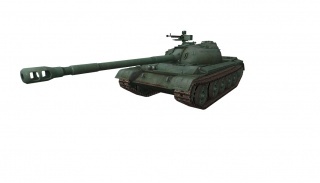 It's widely unknown that the 121 wields the same gun as the IS-4, a tier 10 heavy tank. Installed on a medium tank, however, the gun sports a 25% faster reload speed. This reload can be shaved down to ~8 seconds with a rammer and BIA, giving it the advantage it needs to compete in a close-range brawl. 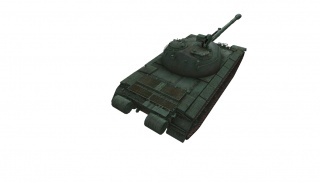 The 121's 120mm front hull is comparable to that of the infamous T-54, and superior to that of the T-62A. As such, T-54 drivers who are familiar with the basic corner maneuver, (see here), can almost triple their armor effectiveness. Furthermore, when done successfully, this maneuver opens up the opportunity for the aforementioned double-tap, tricking the enemy into reloading. Head-on and not angled, the hull is effective to around 200 pen; substantial protection against lower tiers, but otherwise average for tier 10 mediums. Also, the lower glacis is a large weakness and is easily penetrated, unlike on the T-54, where the lower glacis retains 120mm of armor. The 121 is not for everyone. The lack of gun depression can be a huge deterrence; skilled driving and experienced knowledge of the terrain is essential. Hull-down positions can be accomplished by using uneven terrain to take advantage of the strong turret. The 121 can be exceptionally devastating in an aggressive, yet not-reckless, playstyle. It finds itself at home alongside heavy tanks by taking advantage of reloading enemies, friendly heavy armor, and exposed flanks. Although deadly in an one-on-one brawl, the 121 still remains a medium tank. It doesn't have the hitpoints nor armor to spare. Think like an autoloader. Keep in mind that the excellent camo values provide the 121 great flexibility on the battlefield, the maps where it can go full beast mode can be quite limited. One of its historical armaments, a 105 mm rifled gun (copy of the Royal Ordnance L7A1), is missing. This configuration was known as the 121B.